On June 11, the Spark team announced availability of Release 1.4. More than 210 contributors from 70 different organizations contributed more than 1,000 patches. 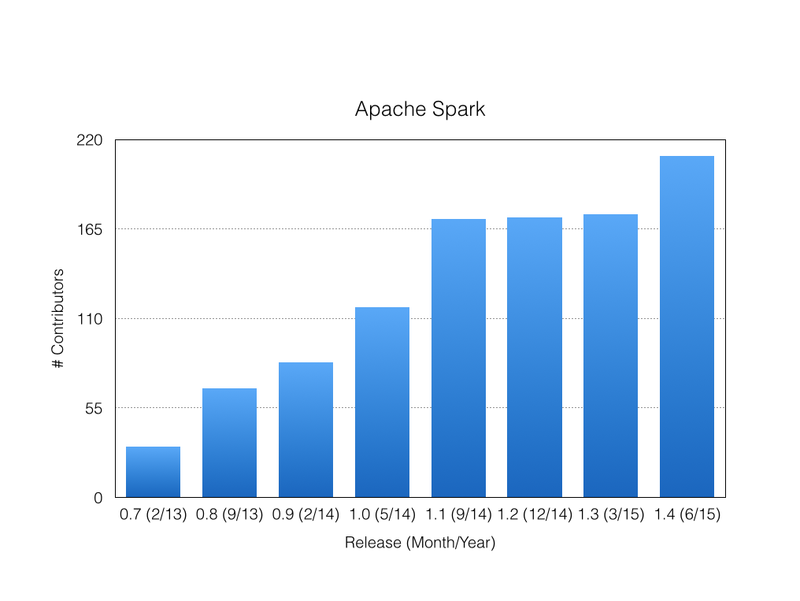 Spark continues to expand its contributor base, the best measure of health for an open source project. Two Mesos enhancements: Docker support and cluster mode. This release includes extensions of analytic functions for DataFrames, operational utilities for Spark SQL and support for ORCFile format. A complete list of enhancements to the DataFrame API is here. AMPLab released a developer version of SparkR in January 2014. In June 2014, Alteryx and Databricks announced a partnership to lead development of this component. In March, 2015, SparkR officially merged into Spark. SparkR offers an interface to use Apache Spark from R. In Spark 1.4, SparkR supports operations like selection, filtering and aggregation on large datasets. It’s important to note that as of this release SparkR does not support an interface to MLLib, Streaming or GraphX. There appears to be an effort under way to rebuild MLLib’s supervised learning algorithms in ML. There is a single enhancement to GraphX in Spark 1.4, a personalized PageRank. Spark’s graph analytics capabilities are comparatively static. The enhancements to Spark Streaming include improvements to the UI plus enhanced support for Kafka and Kinesis and a pluggable interface for write ahead logs. Enhanced support for Kafka includes better error reporting, support for Kafka 0.8.2.1 and Kafka with Scala 2.11, input rate tracking and a Python API for Kakfa direct mode.